Charles Gardner Radbourn (December 11, 1854 – February 5, 1897), nicknamed "Old Hoss", was an American professional baseball pitcher who played 12 seasons in Major League Baseball (MLB). He played for the Buffalo Bisons (1880), Providence Grays (1881–1885), Boston Beaneaters (1886–1889), Boston Reds (1890), and Cincinnati Reds (1891). In 1884, Radbourn became only the second National League (NL) pitcher to win a Triple Crown; in the process, he broke the single-season wins record, which still stands today. Radbourn was inducted into the National Baseball Hall of Fame in 1939. Born in New York and raised in Illinois, Radbourn played semi-professional and minor league baseball before making his major league debut for the Buffalo Bisons in 1880. After a one-year stint with the club, Radbourn joined the Providence Grays, leading the team to an 1884 World Series championship. In 1885, when the team folded, the Grays roster was transferred to NL control, where he was claimed by the Boston Beaneaters. Radbourn spent the next four seasons with the club, and finished his MLB career with the Cincinnati Reds after a one-year tenure with the Boston Reds. Radbourn was born on December 11, 1854, in Rochester, New York, the second of eight children to Charles and Caroline (Gardner) Radbourn. Charles Radbourn (the elder) had immigrated to the United States from Bristol, England, to find work as a butcher; Caroline followed soon after. In 1855, the Radbourn family moved to Bloomington, Illinois, where Radbourn was raised. As a teenager, Radbourn worked as a butcher with his father, and as a brakeman for the Indiana, Bloomington and Western Railway company. In 1878, Radbourn joined the Peoria Reds, a barnstorming team, as their right fielder and "change pitcher". No substitutions were allowed at the time so if the starting pitcher became ineffective in the late innings the change pitcher, usually playing right field, would exchange positions with the starter to try to save the game. In 1879 he signed with Dubuque in the newly formed Northwest League. He finally made the major leagues in 1880 as second baseman, right fielder and change pitcher for the Buffalo Bisons of the National League. He played in six games, batted .143, never pitched an inning, but practiced so hard he developed a sore shoulder and was released. When he recovered he pitched for a pick-up Bloomington team in an exhibition game against the Providence Grays. He impressed everyone so much that Providence signed him on the spot for a salary variously reported as $1,100 or $1,400. Opening Day 1886 team photo of Boston Beaneaters and New York Giants. 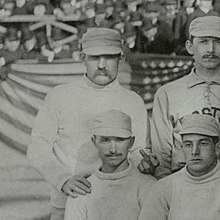 Radbourn (standing, far left) is pictured giving the finger to the cameraman, the first known photograph of the gesture. As a starting pitcher for the Providence Grays (1881–1885), Boston Beaneaters (1886–1889), Boston Reds (1890), and Cincinnati Reds (1891), Radbourn compiled a 309–194 career record. In 1884 he won the National League's pitching Triple Crown with a 1.38 earned run average, 59 wins and 441 strikeouts. His 59 wins in a season is a record which is expected never to be broken because no starter has made even as many as 37 starts in a season since Greg Maddux in 1991. Also, his ​678 2⁄3 innings pitched in 1884 stands at second all-time, behind only Will White (680 in 1879), for a single-season. It, too, is a record that will most likely never be touched. It was made possible by the mid-season expulsion of the Grays' other main pitcher, Charlie Sweeney. Radbourn on an 1887–1890 Goodwin & Company baseball card (Old Judge (N172)). When Providence failed to win the pennant in 1883, the franchise was on shaky financial ground. Ownership brought in a new manager, Frank Bancroft, and made it plain: win the pennant or the team would be disbanded. Jealousy and hatred between Radbourn and Charlie Sweeney, the other ace pitcher on the team, broke out into violence in the clubhouse. Radbourn was faulted as the initiator of the fight, and was suspended without pay after a poor outing on July 16, having been accused of deliberately losing the game by lobbing soft pitches over the plate. But on July 22, Sweeney had been drinking before the start of the game and continued drinking in the dugout between innings. Despite being obviously intoxicated, Sweeney managed to make it to the seventh inning with a 6–2 lead: when Bancroft attempted to relieve him with the change pitcher, Sweeney verbally abused him before being ejected and storming out of the park, leaving Providence with only eight players. With only two men to cover the outfield, they lost the game. This left the team in a state of disarray with the consensus view that the team should be disbanded. At that point, Radbourn offered to start every game for the rest of the season (having pitched in 76 of 98 games the season before) in exchange for a small raise and exemption from the reserve clause for the next season. From that point, July 23 to September 24 when the pennant was clinched, Providence played 43 games and Radbourn started 40 of them and won 36. Soon, pitching every other day as he was, his arm became so sore he couldn't raise it to comb his hair. On game day he was at the ballpark hours before the start, getting warmed up. He began his warm up by throwing just a few feet, increasing the distance gradually until he was pitching from second base and finally from short centerfield. After the regular season ended, the Grays played the American Association champion New York Metropolitans in the 1884 World Series. Radbourn started each game of the series and won all three, while allowing just three runs. There is a discrepancy in Radbourn's victory total in 1884. The classic MacMillan Baseball Encyclopedia, as well as the current Sporting News Baseball Record Book both credit Radbourn with 60 wins (against 12 losses), as does his National Baseball Hall of Fame biography. Other sources, including the Baseball Reference and Baseball Almanac links shown here, give Radbourn 59 wins. Some older sources (such as his tombstone plaque) counted as high as 62. There is no dispute about the 678⅔ innings pitched, only over the manner in which victories were assigned to pitchers. That can be a contentious issue, as the rules in the early years allowed more latitude to the official scorer than they do today. According to at least two accounts, in the game of July 28 at Philadelphia, Miller pitched five innings and left trailing, 4–3. Providence then scored four runs in the top of the sixth. Radbourn came in to relieve, and pitched shutout ball over the final four innings, while the Grays went on to score four more and to win the game, 11–4. The official scorer decided that Radbourn had pitched the most effectively, and awarded him the win. Under the rules of the day, the scorekeeper's decision certainly made sense. However, under modern scoring rules, Miller would get the win, being the "pitcher of record" when he left the game, and Radbourn would have been credited with a save, for (ironically enough) closing the game and "pitching effectively for three or more innings". Some modern statisticians have retroactively awarded the win to Miller. On the MLB.com page about Radbourn, he is credited with 59 wins and a save instead of 60 wins. Edward Achorn's 2010 book, Fifty-nine in '84, adheres to the revisionist view of Radbourn's 1884 statistics. After retiring, Radbourn opened up a successful billiard parlor and saloon in Bloomington, Illinois. Dating back to his playing days, he had always had a reputation for being a bit vain. Radbourn was seriously injured in a hunting accident soon after retirement, in which he lost an eye, spending most of his remaining years shut up in a back room of the saloon he owned, apparently too ashamed to be seen after the injury. Radbourn died in Bloomington in 1897 and was interred in Evergreen Cemetery. He was elected to the Baseball Hall of Fame in 1939. In 1941 a plaque was placed on the back of his elaborate headstone, detailing his distinguished career in baseball. It is speculated Radbourn might be the namesake of the charley horse, a painful leg cramp not unlike that from which he suffered. ^ McKenna, Brian. "Old Hoss Radbourn". The Society for American Baseball Research Biography Project. The Society for American Baseball Research. Retrieved October 1, 2011. ^ Jazayerli, Rany (March 2, 2004). "A Brief History of Pitcher Usage". Baseball Prospectus Basics. Baseball Prospectus. Retrieved October 20, 2016. ^ Under modern rules, a team that is unable to field nine players would have to forfeit the game, but a substitution would be allowed. ^ "1883 Providence Grays – Statmaster Pitching Results". Retrieved 2011-07-04. 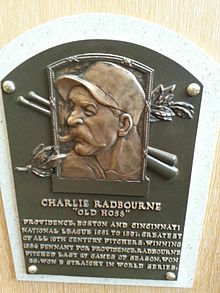 ^ "Radbourn, Charles". National Baseball Hall of Fame Museum. ^ Quinion, Michael (2011). "Charley horse". World Wide Words. Retrieved June 17, 2011. Achorn, Edward (2010). Fifty-nine in '84: Old Hoss Radbourn, Barehanded Baseball, and the Greatest Season a Pitcher Ever Had. Smithsonian Books. ISBN 978-0-06-182586-6. Kahn, Roger (2000). The Head Game. New York: Harcourt. ISBN 0-15-100441-2.